Sumo Cyco are a four piece female fronted rock band from Toronto, Ontario Canada who formed back in 2011 and for the past year they have been trying their hardest to crack Europe and the UK and have embarked on tours with the likes of Mushroomhead, Butcher Babies, Alien Ant Farm, Hed PE, Fozzy, Nonpoint, Devilskin and various other bands and now they are gearing up to release thei r second studio album ‘Opus Mar’ which really has the potential to make Sumo Cyco one of the hottest new rock bands to take the UK by storm. With ‘Opus Mar’ Sumo Cyco independently crowdfunded the album and totally smashed their campaign goal by reaching 249% of their goal and now the band are days away from unleashing the album on the world and if you have heard the singles ‘Anti-Anthem’ and ‘Move Mountains’ then you will know exactly what to expect from the album but if you have not been lucky enough to hear the singles yet then you will be pleasantly surprised with ‘Opus Mar’ and most probably walk away a fan of Sumo Cyco as the album rocks in an catchy nature. The album opens with the lead single ‘Anti-Anthem’ which perfectly sets the scene for the 40minutes as the band smash in with heavy riffs, bouncy bass lines, pounding drum beats and epic vocals from front lady Skye Sweetnam who has one hell of a voice, a voice which is going to take Sumo Cyco far. ‘Free Yourself’ opens with massive drum beats and moments later Skye Sweetnam comes in with her mega infectious vocals and before you know it the song takes you on a massive whirlwind journey full of super charged guitar riffs, massive break downs, lead vocals which show off Skye Sweetnam massive vocal range and chanty backing vocals which really bring the song to life. ‘Move Moutains’ has recently been released as a single and is one of the stand out songs on the album for the fact that it features guest vocals from Skindred’s Benji Webbe and his vocals working alongside those of Skye Sweetnam work so well and help make the song a massive infectious radio friendly dance-rock anthem that should be blasted out of your speakers at full volume whilst you dance around your room like no one’s watching. Instrumentally ‘Passengers’ is a strong track and you just have to listen to the opening 30 seconds to realise that as the band go all out and when the song gets going and hits the 1minute mark it vocally comes alive with Skye Sweetnam singing along as fast as ever and backing vocals from the rest of the band gracing the airwaves giving off a slight Ben Kowalewicz from Billy Talent feel. There are no dull moments to be found in ‘Opus Mar’ as every song flows well and sounds strong such as the heavily rap featured ‘Brave II’, the Billy Talent sounding ‘Kids Of Calamity’, the rocking ‘Words’ all the way to the fast paced album closer ‘Building Castles’. 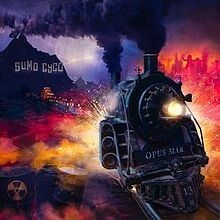 Overall ‘Opus Mar’ is one hell of a great listen, the band remind me slightly of a female fronted Skindred as there are elements of funk, punk, dubstep and rock flowing through the album and it also helps the fact that Skindred’s Benji Webbe guests on the album, guitarist and co-producer Matt Drake deserves a mention as his riffs throughout the album are outstanding, in fact the whole band are talented musicians which easily shows through the whole album, an album which is going to get a lot of people talking about Sumo Cyco.